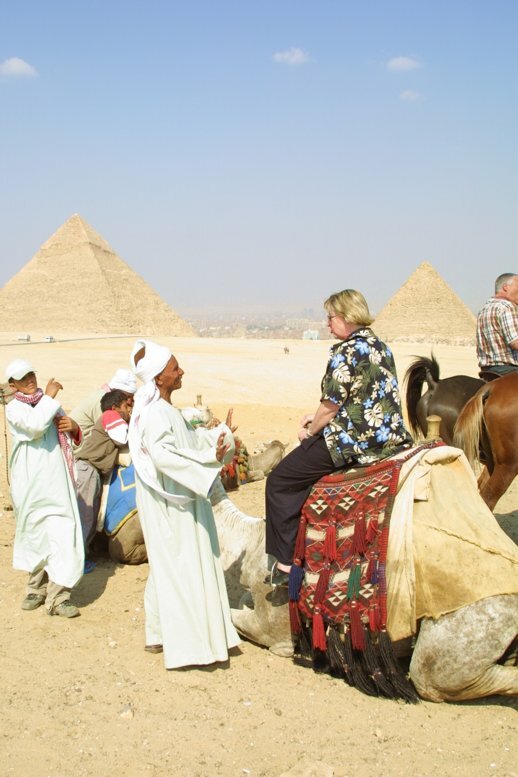 Although we have traveled all over the globe, Egypt remained a place where many of our friends said we should visit. So, on April 23 we left Heathrow for Cairo International Airport for a 12-day trip to Egypt. We were scheduled to spend the first three nights in Cairo and then fly south to upper egypt area for five nights. 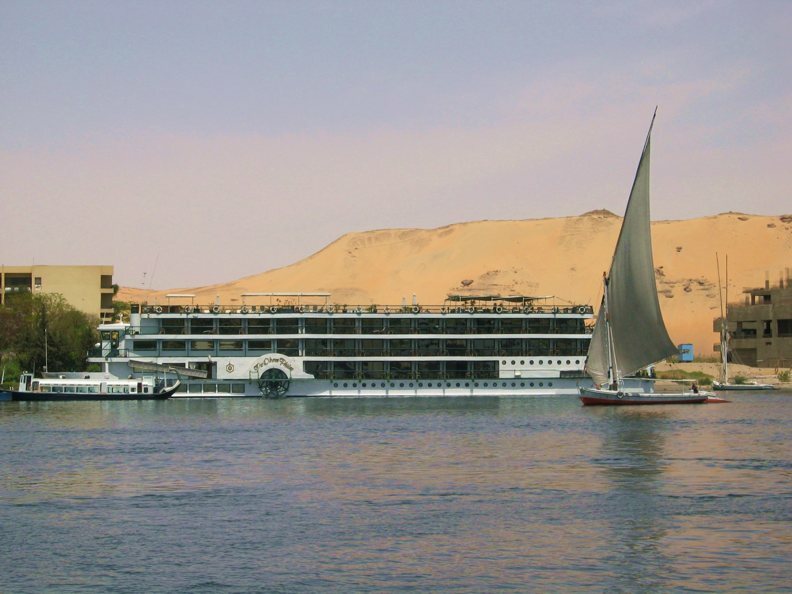 We would spend the first night in upper egypt area in a hotel in Aswan, then board a Nile cruiser for four nights floating down the Nile. Following that, we were to fly back to Cairo for the remaining three nights. 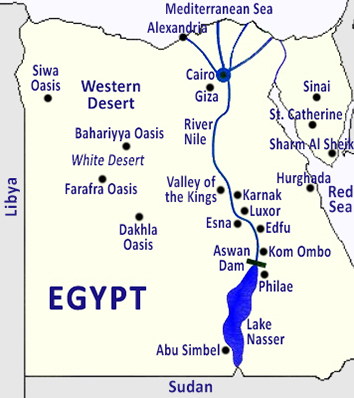 Now you have to keep in mind that upper egypt is south of Cairo. Our arrival at Cairo International Airport was uneventful but we had a long drive to the hotel. We had opted to stay in Giza to be near the pyramids but this left us on the opposite side of Cairo from the airport. Fortunately, having arrived at 10:30 p.m., traffic was relatively light; in Cairo, traffic is never light. Indeed, it didn't take but minutes to verify a couple of things. One, we were very happy to see the guy with a sign with our name on it and be taken to our van because the taxi alternatives were not reassuring. Two, it is unlikely that we, and our luggage, would have fit into the local taxis, which were both small and road weary. And three, there is no way in the world we would drive a rental car on these roads. We're used to a lot of different traffic conditions and have driven all over Europe. But this traffic was about as bad as we've ever seen, a point verified by a variety of fellow travelers. Every manner of motorized transportation was on the roads and all were seemingly indifferent to the other drivers on the road and the lane designations. Drivers would be in the left lane lazing along while trucks and taxis and cars darted around them, honking their indignation at the slow driver. In Egypt, if you are the faster car, you honk your horn to warn anybody who may get anywhere near your lane that you're there so watch out. And this was how it was for the next 45 minutes. Arriving at our hotel, the Le Meridian Pyramids, we were told to be ready to go tomorrow for the tour of Cairo at around 10:00, which gave us plenty of time to catch up on our sleep. Also, very conveniently, our hotel had a cash machine so we were able to get enough Egyptian Pounds for all of the tips. 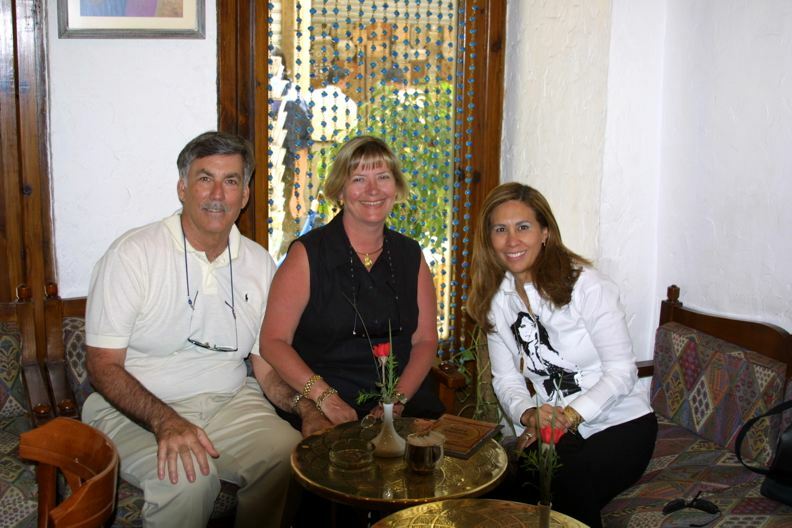 Baksheesh, or a tip, is a fundamental way of doing business and we used it a lot. We had also brought a lot of $1 and $5 bills for this purpose. Our experience in Africa had taught us that while US$ were widely accepted, we should not expect the locals to be able to break larger bills. We had also been assured that we would have a room with a view of the pyramids. But looking out of our window we could see nothing. However, the bellman assured us that the pyramids were "over there" pointing toward nothing we could see in the black of the night. Mike had kind of assumed that the Pyramids would be all lit up. So, it was with great delight the next morning when Mike opened the curtains that the pyramids were indeed over there. 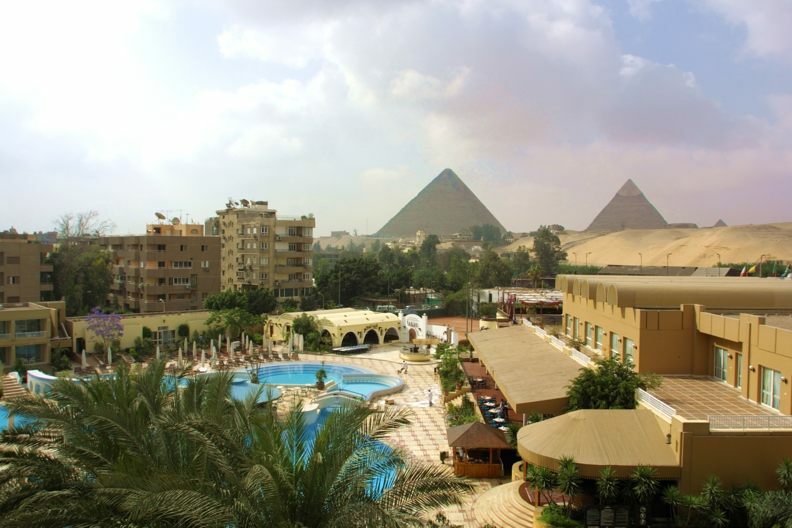 We never doubted the wisdom of getting a room with a view of the pyramids. They were awesome. Anyway, the next morning we met Shareen, who would be our guide in Cairo. And the first thing that she did was to rearrange our tour. Our original schedule had us doing the Cairo museum before leaving for upper egypt. She wisely switched that visit to the end of the trip where everything that we would see in the museum would then be in context with what we had seen on the trip. We absolutely recommend this sequence. The other factor was the weather; there was no wind so it would be appropriate to do the outside tours first. So, over the next two days of touring, we did Memphis and Saqqara and the Coptic section of Cairo and the pyramids and the sphinx and a lot of other old things you see in Cairo. And, we were also scheduled for a camel ride. As thrilling as the ride sounded, Mike passed, leaving Kath to experience the thrill by herself. As usual, she loved it. She'll ride darn near anything: donkeys in Greece, Elephants in Thailand, India, and Nepal and horses in Argentina. Anyway, there's not much to add about the pyramids you don't already know. They are, indeed, very big and very impressive. 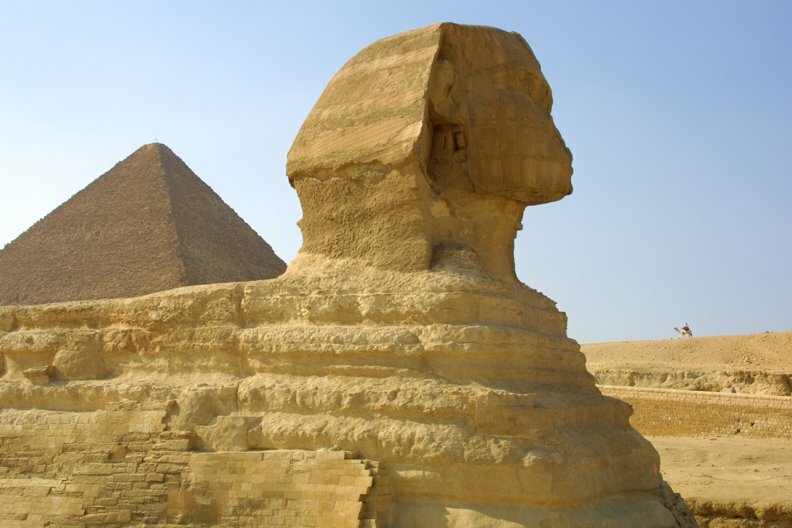 The sphinx, on the other hand, was very disappointing because of the terrible shape it's in. Fortunately, the weather was nearly perfect for the viewing although Mike would recommend that you see the Sphinx in the morning to get better sun. The bottom line is that the sights were really impressive. But more than that is the history of Egypt and of Cairo. We cannot overemphasize the importance of having an entertaining and knowledgeable guide to explain everything to you. Shareen was just great and having a guide and driver to ourselves is the only way to go. She spent a great deal of time answering our questions and discussing ancient and modern Egypt and we could take all the time we wanted to tour the various sites. We also had some interesting conversations about politics and religion. Also, being inveterate shoppers, over the next two days we just had to do some shopping after we finished touring. 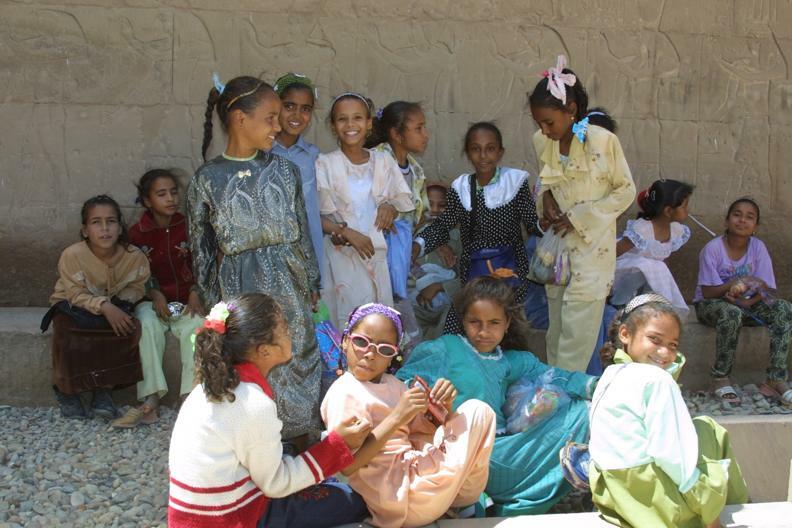 Now we are very much opposed to going to the "factories" or "schools" as they were called in Egypt. They are outlets for tourists under the guise of being a factory outlet and the people arrive by the bus-load; the quality is generally not the highest, the prices start out much higher than in a comparable downtown store and they generally don't negotiate much. Unfortunately, these were the only shops that were available to us. Knowing that, we still had to stop at the fragrance shop, the jewelry shop, the art store, an alabaster store and the rug factory. Wherever we travel, we look for some gold jewelry to add to Kath's collection and Egypt was noted for having good gold prices. The fragrance shops sell scents, made from flowers and other parts of plants, which are used worldwide to make perfumes. We had seen papyrus paintings everywhere, and some very interesting ones in the hotel so were looking for something along these lines at the art shops; and we were also looking for some interesting local art. Egypt is also noted for its alabaster so we had to see if there was anything of interest there. And, of course, you never have enough rugs so we had to stop by the rug man. The fragrance shops were a novelty to us. You buy bottles of the oils which you can put in little heaters to be placed around the house to provide nice scents. And, while the fragrances were interesting, we just couldn't figure out where we could use them. And, they weren't cheap. Other people we ran into told us that you can buy the same fragrances for a fraction of the cost in the local markets, but there's no way to tell if they're the same quality oils. Very much against Mike's better judgment, we went to the rug factory. Katherine was insisting that we had places in the new house that were crying out for an Egyptian rug. And Mike's concern was justified when the rug man offered us a couple of rugs that Kath just could not turn down. After half an hour of intense bargaining, we bought two rugs that now reside in the living room of Katherine's parents; eventually, they will be moved to the new house. After we negotiated the deal they accused Mike of being Egyptian; it was a good deal. Again, it was nice to have the flexibility, by traveling by ourselves, to shop and negotiate at our leisure. The other thing to watch out for is the time that is consumed at the various shops; you can spend a lot of touring time merely shopping. We kept the visits to the shops to a minimum. We were also introduced to Egyptian wine that night at dinner. First, you have to remember that, as a Muslim country, you can't expect much in the way of alcohol. But, being in Egypt, we decided to try their wine as the only other alternative was an expensive Bordeaux. Well, considering the quality of the wine, it's no wonder the Muslims don't drink. Well, that pretty much occupied our first couple of days. We were next to fly to Abu Simbel by way of Aswan. 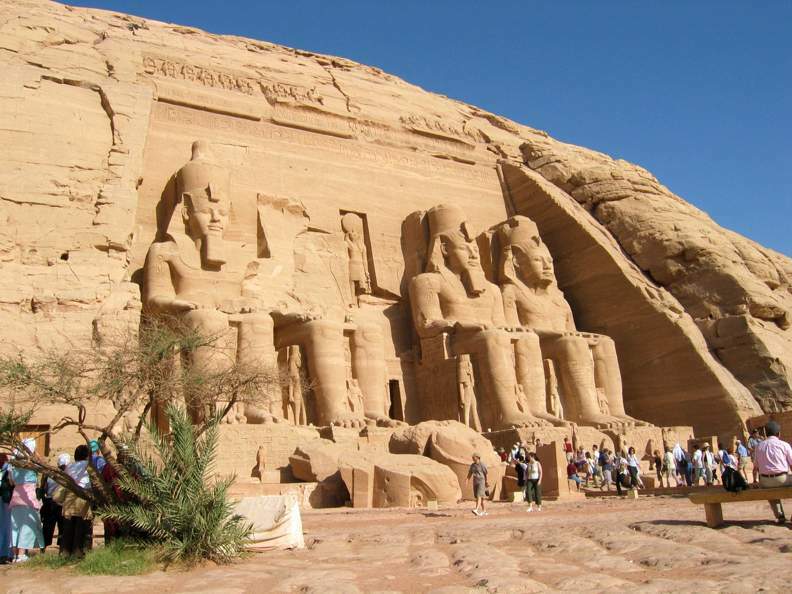 Now, Abu Simbel is considered to be one of the "must see" places in Egypt. 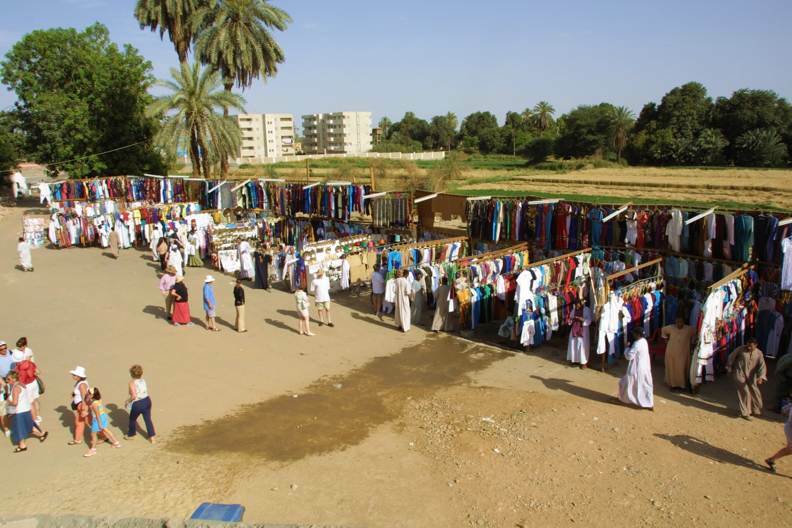 First, you have two ways to get there from Aswan, by air or by bus. The flight is less than an hour versus a 3 hour bus ride, each way; so flying was a no brainer. Second, you're largely on your own going in there. Only local guides can be used so you pay your money, walk about half a mile into the park where the temple is and look for a guide. And, the guide we had wasn't really much good. The guides give you a little spiel about the place and then send you into the temple to look around; guides are not permitted inside. It must have been at least 150 degrees outside and close and crowded, and not much cooler, inside. The ruins were impressive to be sure. However, it was an awful lot of money and effort for the experience compared to everything else we saw. There was also only one toilet facility by the entrance and the women's line was so long that they were using the men's toilet; Mike found the fact that women were walking around behind him while he used the urinals really entertaining. Anyway, after flying back to Aswan we checked into the Old Cataract Hotel, a lovely, old and stately place to stay; Agatha Christie wrote at least part of Death on the Nile there. The view from the terrace in the evening overlooking the Nile was really lovely and the dining room, called the 1902 for when it opened, looked like something out of a time gone by. We meet Abdul, our tour guide for the next four days, late that afternoon. He was an Egyptologist who was working on a site down the river and grew up in a local village. He was delightful and watched over us like a mother hen. He was also an indefatigable source of information about every aspect of ancient Egypt. We began the next day by checking out of our hotel and into the ship that would be home for the next four nights. Our original booking had us on another ship but we were transferred to the Oberoi Philae after a change of schedule and we were duly impressed. Everybody we talked to said it was one of the three best of the 275 or so Nile cruisers. Yep, there are that many ships devoted to just moving tourists up and down the Nile, most of the time just between Aswan and Luxor. Now every ship had pretty much the same layout; three decks and a rooftop area with a shaded sitting area and a pool. It turns out that none of them can be any higher because all of them must travel under a bridge located downriver of our stop the following day. Indeed, the passage under the bridge is a major event with everybody up top to watch us slide under the bridge. After checking in we took a tour of the Aswan dam. One of those must do things that could safely be skipped. It's just a big dam; but the history about it is interesting. 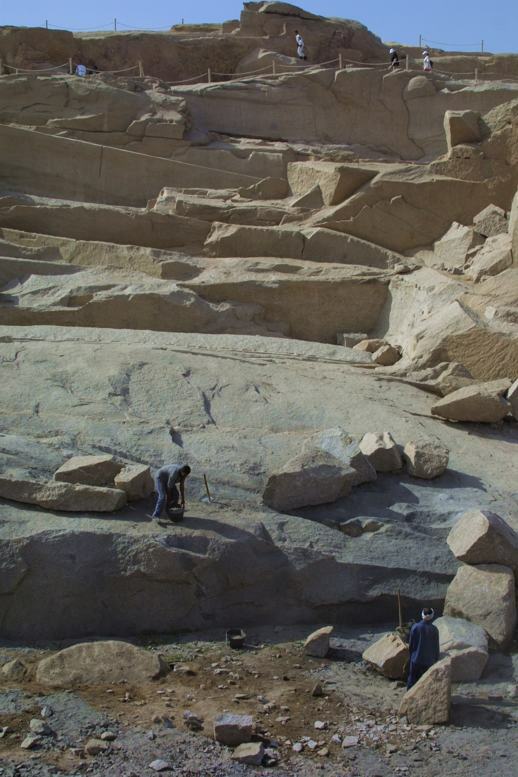 Coming back into Aswan we stopped at a place where the ancient Egyptians cut obelisks. What should have been a relatively uneventful experience took an odd twist. First, seeing how they cut the obelisks is quite interesting. You have to realize these obelisks range in size from some 20 meters and 143 tons as much as 33 meters and 323 tons. 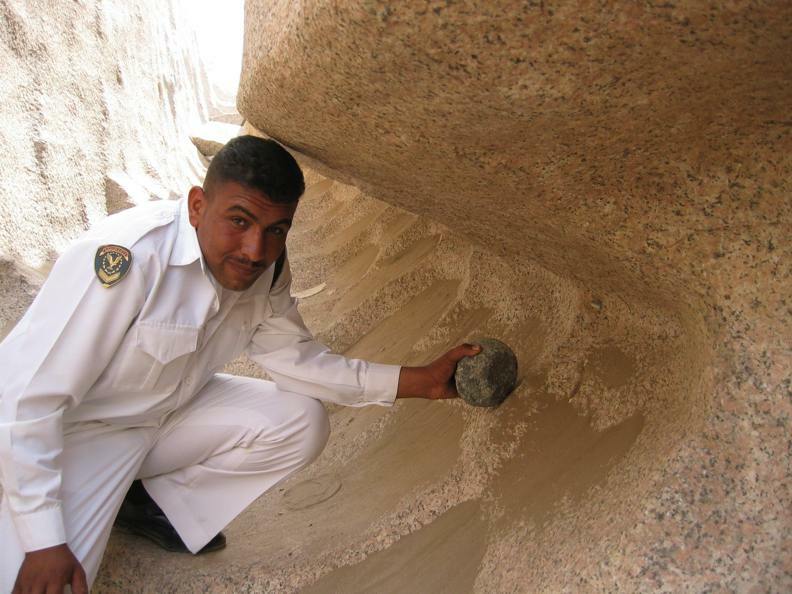 How they cut and then moved these things 3,500 years ago is a feat of no small consequence. However, on the way out, the guard at the top motioned us to follow him and off went Katherine. Now Mike was more than a little leery about following this guy back out of the main tourist area but Katherine was undaunted. Well, he led us to a place where you could actually get down and see how they cut out the obelisks. Thanking him, Mike quickly realized this wasn't a magnanimous gesture; he expected a nice baksheesh. He also said that this was "a secret, private tour and not to tell anyone." From there we went to see Philae Temple which we found very impressive. 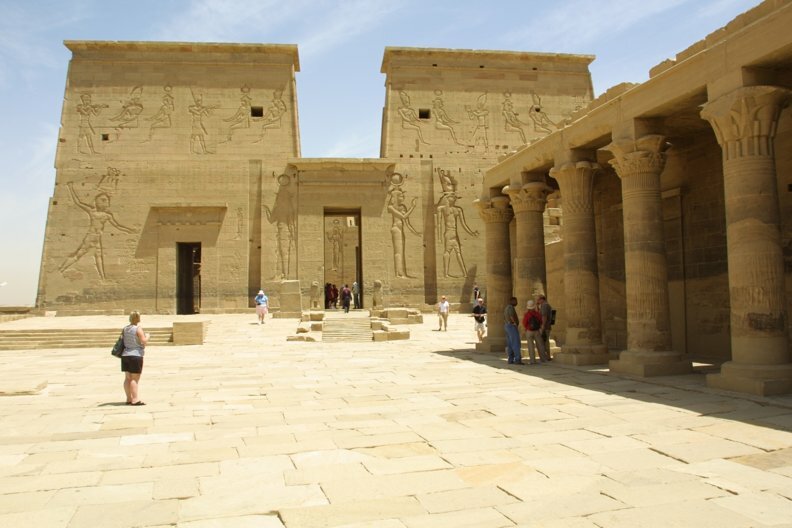 Philae Temple was dismantled and reassembled (on Agilika Island about 550 meters from its original home on Philae Island) to save it from the rising waters of the Aswan Dam. It's a short boat ride out and then maybe two hours to look around. 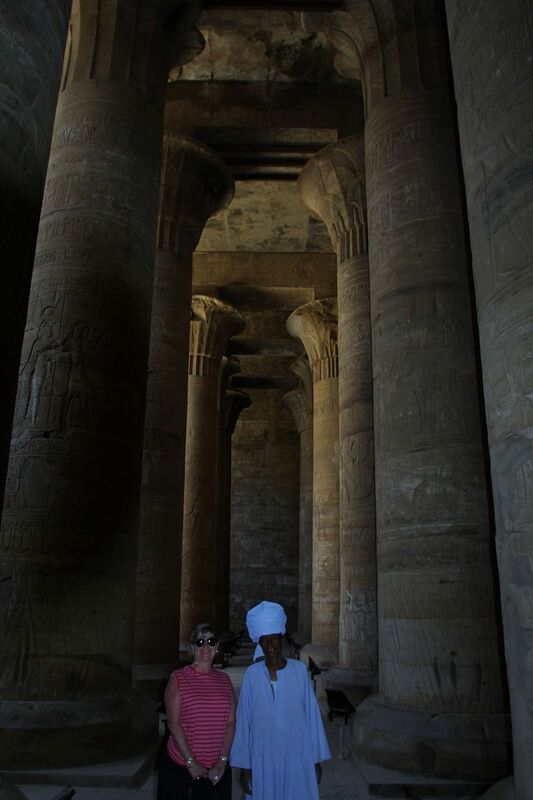 Abdul pointed out to us that the island of Philae was the center of the cult of the goddess Isis and her connection with Osiris, Horus, and the Kingship, during the Ptolemaic period of Egyptian History. As became the ritual from then on, we nodded our heads and tried to remember what he'd just said. But the ruins were very impressive. 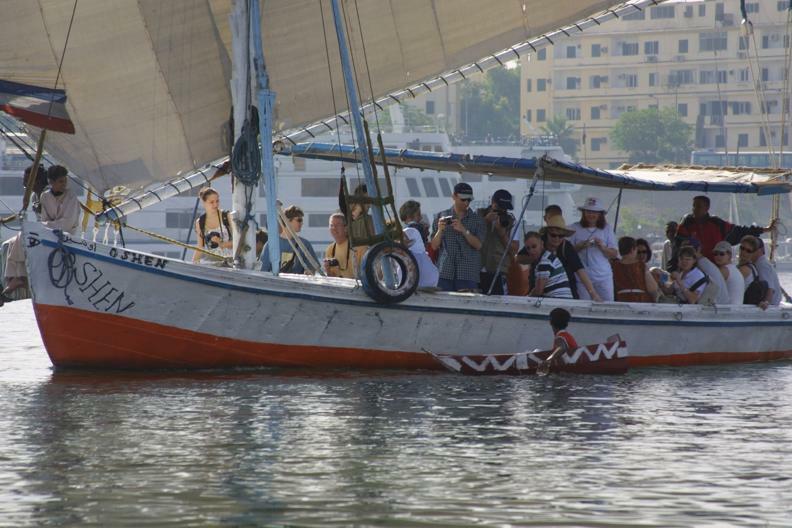 Late that afternoon, after lunch and a nap, we were scheduled for our ride in a Felucca; the sail boats of the Nile. Billed as another "must do" experience, Michael was less than impressed. First, there was no wind during most of the trip so while they offered an interesting view of the river going down river, they had to be towed or rowed back upriver. Second, these boats seemed geared strictly for the tourist traffic and most of them were in relatively poor shape and some didn't offer shade; and have I mentioned that it was hot. Third, while we had the boat to ourselves, thanks to Abdul, the general tour groups were jammed into these little boats. So here were groups of 20 or 30 people, with no room to move in 90+ degree temperatures being towed upriver. 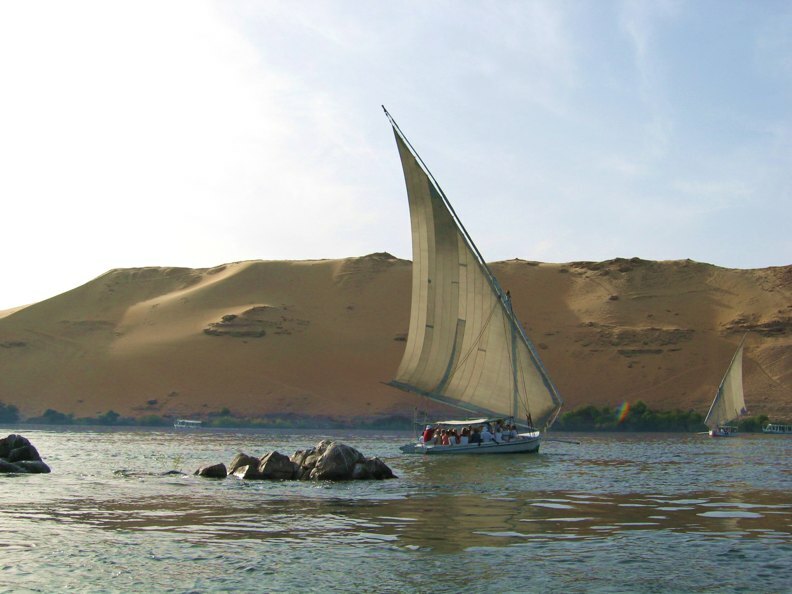 Anyway, unless there is a fairly strong wind, Michael would skip the Felucca and take a leisurely power boat ride. Katherine disagrees and thought the ride was romantic. Funny how men and women see such things so differently. The other thing that was notable was that with the lack of wind, the exhaust from all of the power boats left a pall on the water. It was truly unfortunate in such an otherwise pristine place. In fact, the views from the Nile of the Aswan area were well worth a tour; and the Felucca should have been the way to see it leisurely. Actually, if there is wind, you get sand storms, and without it, no sailing; sometimes you can't win. After that it was back to the ship for dinner. Our ship was indeed luxurious and we had three squares a day on board. There were about 80 people in total and all meals were taken in the main dining room. We had our own table but soon met another couple from London who were seated at a table for four, so we joined them for dinners the next three nights. 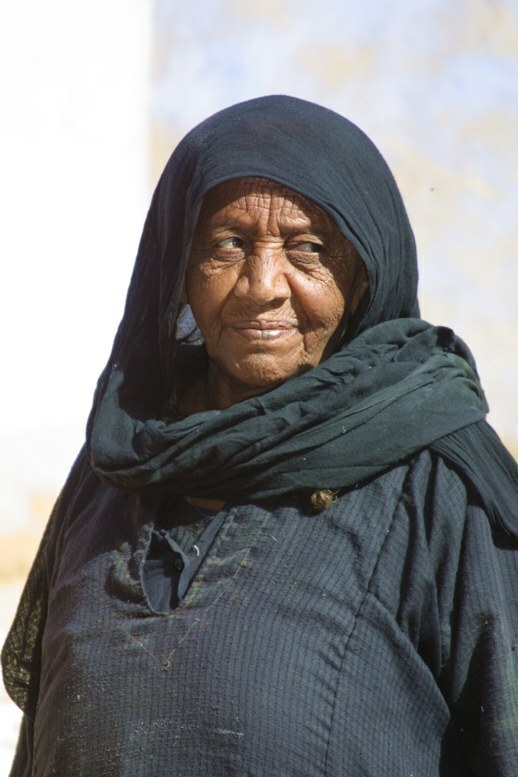 The next morning we had Abdul take us to a local Nubian village and then to the local Souk, or market. Both of these were the kinds of places that we most enjoy. The village was small and centered around a store in the middle and did not see a lot of tourists. The people were friendly and certainly interesting. At the market, most tourists go in alone but here Abdul went along. He proved very helpful in getting people to pose for pictures. 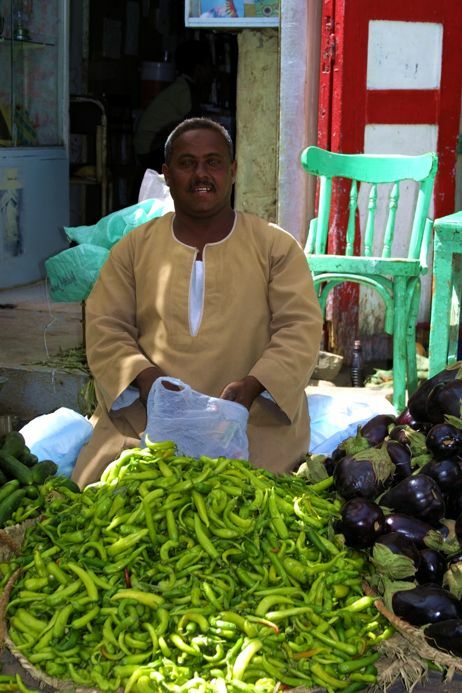 However, we ran into some vegetable salesmen who, intrigued by a picture Mike took of one of them, then all wanted their pictures taken. If you're going to take pictures of people, a digital camera is a must. Back by 11:00 a.m. the ship then sailed for Kom Ombo, a temple where our guide was the main Egyptologist on the site. It was an interesting temple but relatively small. However, we had to make a shopping detour before returning to the boat. That night the dinner had an Egyptian theme and everybody was supposed to come in costume. So, our immediate objective after the tour was to buy a galabeya for Mike. Kath had already found one for her on the boat but Mike couldn't find one to fit. Now, Mike is not usually a big one for costume parties but he was persuaded by our dinner companions that they were coming in costume so he wasn't going to be the only one not participating. So, we had to negotiate with the local vendors, an always exciting proposition. Anyway, after a lot of haggling we found a delightful galabeya for Mike. And the two of us looked very Egyptian that night. Leaving Kom Ombo, we sailed on down to Edfu where we spent the night. The first thing we noticed when we were at breakfast was the lineup of horse-carriages assembled to take the boat passengers to the temple. Now there is no easy way to get to the temple from the boats with all of the carriages coming and going; it's one giant traffic jam on the one road in and out. Anyway, the temple at Edfu was a much more impressive temple. However, the highlight of the tour was a meeting with a school tour. The kids were waiting in the shade before heading out of the temple and Mike persuaded a couple of girls to let him take their picture. Then on showing them the digital image, Mike was swamped with requests for pictures. Another group of them wanted to talk to Katherine about where she was from, how did she like Egypt and so on. It was very entertaining. As usual, some of our best travel experiences are interacting with the local children, as you can tell from looking at the pictures of our many travels. Anyway, after that we sailed for Luxor. Now, this turned out to be another adventure. First, we left around noon with the expectation of arriving in Luxor that night. Then we were to be picked up the next morning at 5:00 a.m. for a balloon ride. Now Mike is very acrophobic so has put off Katherine on doing this for many years. But, Mike gave in this time and decided to go for it. Well, the next morning at 4:30 a.m. we arose to find ourselves still underway; this was clearly not an encouraging sign. 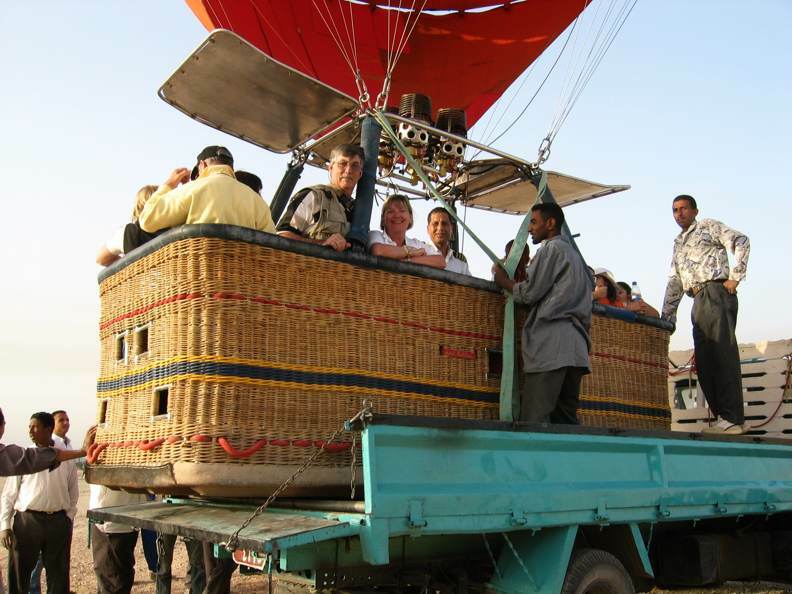 And two hours later as we were coming into Luxor, we got a view of our balloon ride crossing the Nile in front of us. There are two major obstacles between Edfu and Luxor. 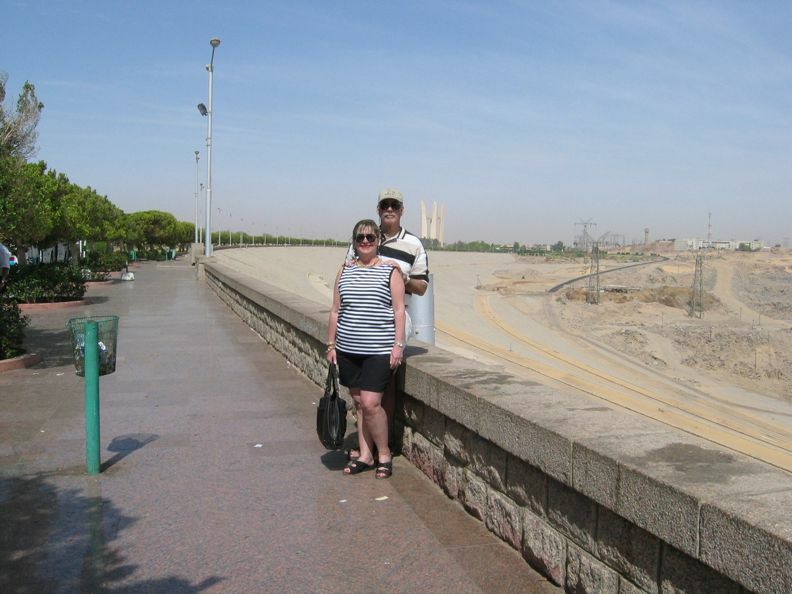 The first is the bridge below Edfu. The problem is that the bridge must be opened to allow boats to pass through. However, it remains open for only one hour and then closes for three hours to let the local residents cross. And boats can only go in one direction at a time and there are boats going both up and down the river. So at around 5:00 that afternoon we found ourselves with another dozen boats awaiting our turn to go through; the problem was that the bridge was expected to close at around 5:30. At 5:30 our captain attempted to follow a couple of boats through before two coming upriver were to go through. Unfortunately, we were turned away at the last minute and so ended up moored along the shore until 8:00 p.m. So, when the time came to go through, everybody was up top cheering the passage. The cheering soon ended when we found out that we still had to negotiate the locks at Esna. It was then explained to us that only two boats can go through at a time and there were a lot of boats in front of us. And, once again, we went to bed moored along the river. Anyway, apparently we got through the locks at around 4:00 a.m. which meant that we would miss our balloon trip. No big deal fortunately because our guide and the boat GM got our ride rescheduled to the following morning. What a delight, up at 4:00 am two mornings in a row! All in all, the trip down the Nile was interesting, if a little boring. We are definitely not cruise people. Sitting and relaxing by the pool doesn't seem to be in our nature. Yes, there are some ruins to see, some local villages here and there and people working in the fields. But most of it is so far away you can't make out much. However, you do begin to realize how dependent on the Nile for water everything is. For the strip of farmed land along the river is remarkably narrow and beyond that is barrenness. Nothing but rock and sand. You are indeed on the edge of the Sahara desert. With our change of plans, Abdul reshuffled our tour. So, our first day in Luxor we did the Valley of the Kings, the temple of Queen Hatshepsut, the Colossi of Memnon and the tombs of the Nobles. Several things stood out. 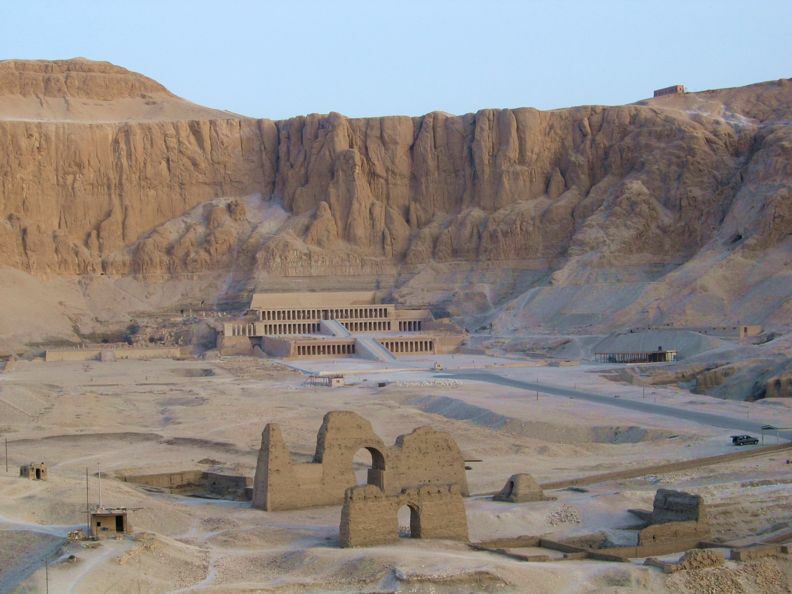 The Valley of the Kings is duly impressive; at last count, the burial places of some 60 kings. You can see as many tombs as you want to but beyond three there is a charge per site. So we visited three burial sites; one small, one medium and one large. You have to be pretty dedicated to want to do more than that. But it is quite moving to see the writings on the wall and to envision what it must have been like before the tombs were plundered. We did not go see King Tut's tomb as we were told it is fairly unimpressive. 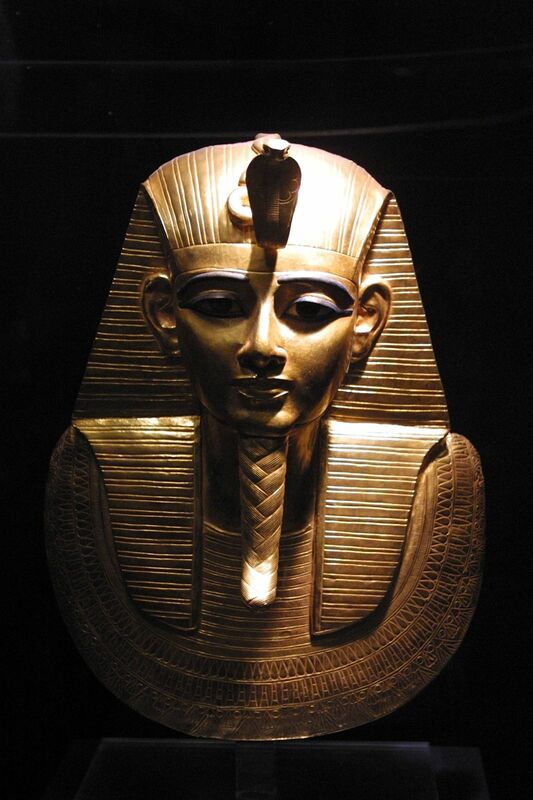 The fact of the matter is that all of the tombs, with the exception of King Tut's tomb, were plundered of everything. What you don't realize, until you see the King Tut display at the Cairo museum, is just how opulent the burial sites must have been. King Tut was a relatively minor king who died at 19 and yet his display at the museum is nothing short of spectacular. To realize that, and how small his burial site was, you can only imagine the treasures that must have been in the other sites. One of the interesting things that we had Abdul do after lunch was to take us on a carriage ride through the streets of Luxor and the local market. 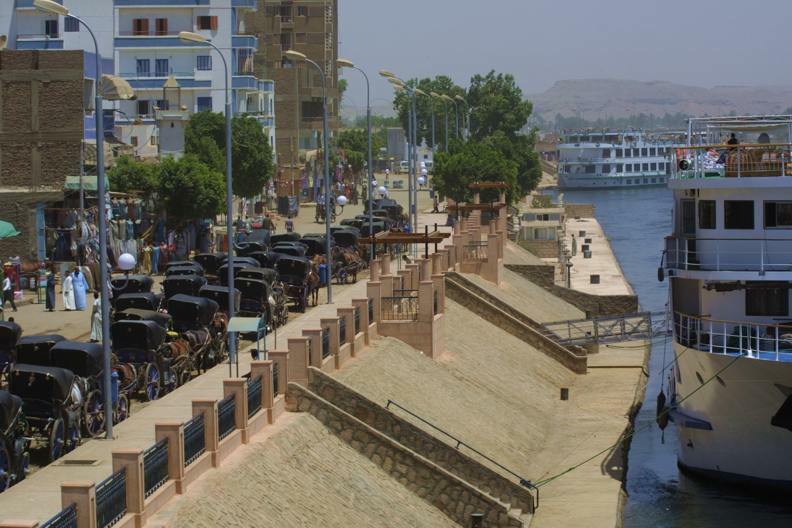 For about an hour and a half we just rode around viewing Luxor, which is a great way to see a city. Unfortunately, it is virtually impossible to take a photograph from a moving carriage. One of the odd things we noticed on our tour were the many unfinished buildings. Everywhere we went there were buildings that looked like they'd just never finished the top floor; there was rebar sticking up and floors that looked like they'd been stopped in mid construction. It seems that there is some kind of tax you incur once you finish a building; so they just kept adding to them as their family grew but never really finished construction. We ended the day with a visit to the Temple of Luxor. Both of us, and other people we talked to, felt that this was the most impressive of all of the temples. It's much bigger than any we had visited thus far and grander in many ways. And Abdul regaled us with the events told by the hieroglyphics on the walls. Well, the next day we were picked up at 5:00 a.m. for the trip over to where we would catch our balloon ride. We really had no idea what was involved so it was with great trepidation that Mike got ready to get into the gondola. It held 16 people in four separate compartments plus the pilot. Calling the guy who turns the gas burner on and off the pilot is a bit of a stretch because there wasn't a lot he could do to guide us. Anyway, we were 100 feet up before Mike quit playing with his camera and realized we were afloat. It was the gentlest feeling imaginable; totally quiet except for the occasional firing of the gas burner. 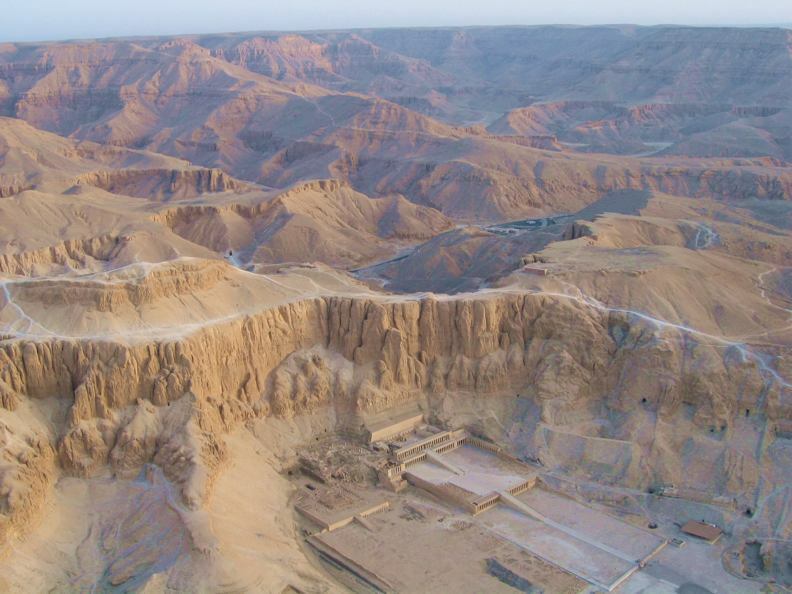 The advantage of the balloon ride was quickly revealed when we floated over the temple of Queen Hatshepsut and the Valley of the Kings. From the ground these two sites are certainly impressive, but seen from the air you get a real sense for their size and grandeur. 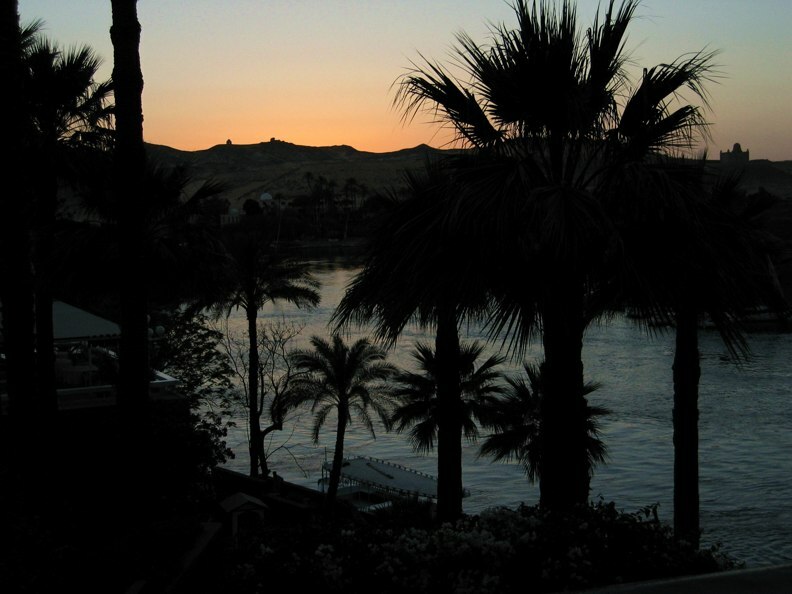 And the view of Luxor with the sun rising over the Nile was also striking. Anyway, we floated around for maybe an hour before finally settling back to a gentle landing. And never once did Mike have any sense of acrophobia; indeed Mike found looking over the side of the gondola into the scene below to be fascinating. Back to the ship to clean up and exit our room within an hour; everybody had to checkout by 8:00 a.m. So, we then grabbed breakfast and headed out again with Abdul for our last tour of Luxor. We began with a visit to Karnak before Abdul would drop us off at the Luxor Museum. Now Karnak is probably the biggest of the temple complexes and indeed consists of three main temples, smaller enclosed temples and several outer temples. As big and complex as it was, neither of us was as impressed as we were with the Temple of Luxor. It was just too busy. We should note, however, that the Hypostyle Hall is considered to be one of the world's greatest architectural masterpieces. Unfortunately, our final stop on upper egypt, the Luxor Museum, was a bit of a disappointment. Yes, there are some interesting artifacts but it's fairly small. It would seem that all the really important stuff was moved to the Cairo Museum. After that, we had five hours on our own before being picked up to be taken to the airport. So, we had lunch at a restaurant and then decided to walk back to the boat on the promenade along the Nile. During that one mile stroll we don't think that one buggy or taxi driving by did not honk its horn and yell at us asking us if we would like a ride. They apparently assumed that we were too dumb not to realize that all we had to do was step into the street to flag one of them down. Abdul was a great guide and a very qualified Egyptologist. He is looking forward to being a University professor in a few years and clearly loves to lecture. We got quizzed each day and also had cumulative exams. We learned a lot of history, and much of it was fascinating, but we both were mentally exhausted by the end of our tour with him. But, one of the most endearing features of Abdul was his pronunciation of several words. Temple was pronounced 'tumble' and each time he said it and Katherine had to stifle her giggles. And we were both 'tumbled out' by the end of our tour of Upper Egypt. Anyway, our trip back to Cairo and to our hotel was uneventful; just the way we like it. And, upon awakening, we had another glorious view of the pyramids! What we had left to see was the Cairo museum and the Cairo market. Now we've been to a lot of museums and generally overdose on things after an hour or so. But the Cairo museum is really spectacular, and particularly the King Tut exhibit. It's not a big museum, but it represents upwards of 5,000 years of history. 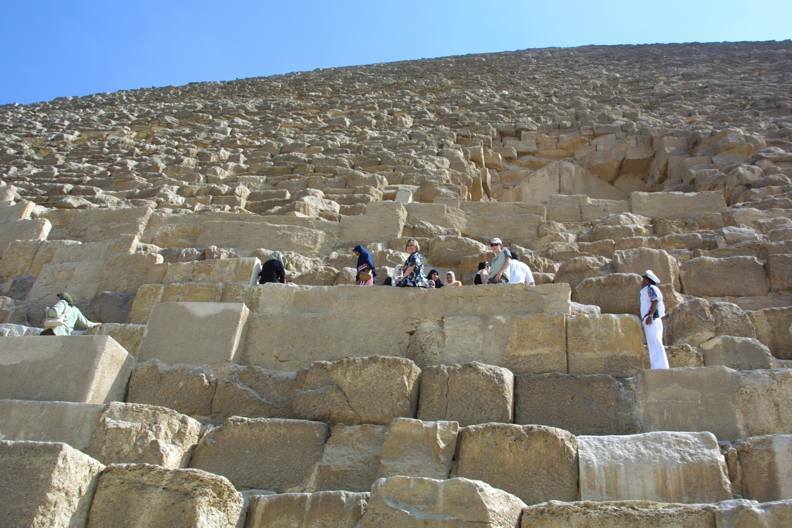 And, it is definitely a place you will want to visit after touring Upper Egypt. 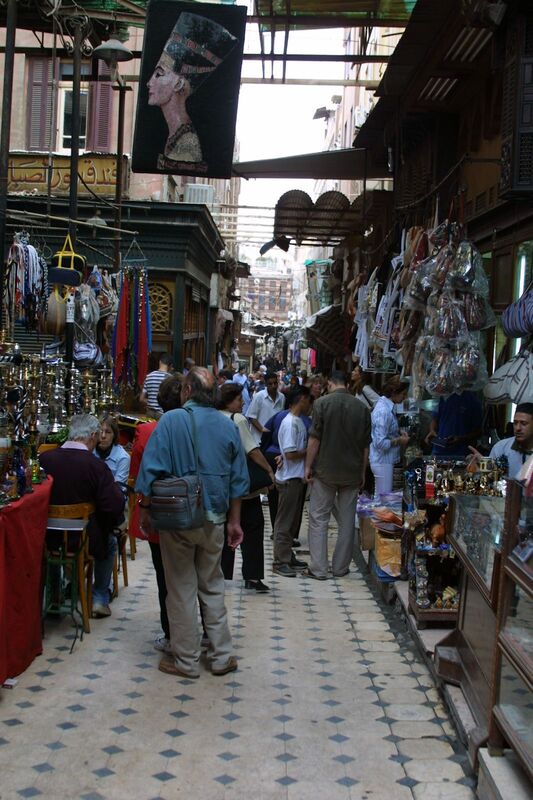 After that, we began with a tour of the famous Khan el Khalili Bazaar. 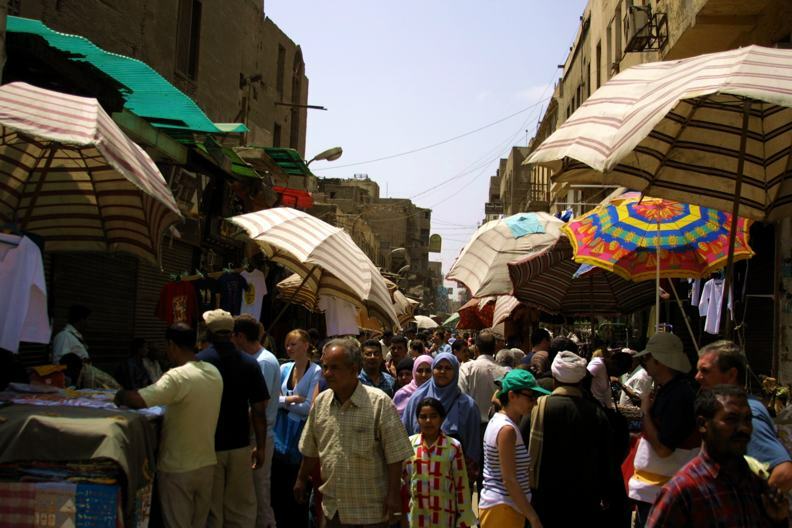 It is billed as the largest souk in the world and has the greatest variety and most artistic goods on sale in Cairo. It's a big market, a tourists' delight, and it does have a lot of shops to peruse. We didn't have the time to visit the souks catering to the locals, and our guide was not encouraging us to go; and after we had driven by one to check it out by car, we agreed. Anyway, we had seen a papyrus painting and a copper tray at the hotel that we liked so we spent some time looking for these in the various shops. Now it is imperative that we buy unusual things to add to our home museum so we figured we would go back to the market the next day to buy what we wanted before finishing with Cairo. However, what became fairly apparent as we began to get familiar with things was the low quality of most of the things we looked at. We didn't see but a few things that would truly represent the art of Egypt. What were proffered were cheap knockoffs of real art. In one of the art shop "schools" we visited, we did see some local art. But that was being offered for thousands of dollars, they only had one artist that was any good and only one of his paintings; and they didn't want to negotiate. Had we had the inclination, we might have looked around Cairo for the art dealers and good jewelry stores, if they existed; But it's a very big city and we just didn't have that kind of time. We did find a replica of an old Egyptian chest that we liked and Michael did find an enormous copper tray with stand that now serves as a coffee table in front of the guest room sleeper sofa. And, Katherine has a lucky gold scarab as well. Michael did feel that the market had one major defect; they don't serve beer at the local cafes. In fact, we couldn't even get large bottles of sparkling water, only little bottles of Perrier. But there were lots of teas and coffees. Bargaining is definitely an art in Egypt. As we've mentioned, the factories don't bargain much. The problem is that nearly all tourists will make one stop in their factory and they know it. Someone on a tour does not have the luxury of doing price comparisons and being able to return to the store they like; people who arrive on a bus are on a schedule. Now as long as you're not spending much, why bother. But if you're buying art or jewelry or rugs, you could be talking some serious money to be saved by negotiating. They will come down 10% for just about anybody. If they are serious, they will come down 20%. But, particularly for expensive items with a lot of markup, you should be able to negotiate 30-50% discounts. When they say, "How much to buy right now?" you have to really low ball them and be prepared to leave. But you have to give them a reason to give you a good price. And they have to like you. So don't make the negotiations personal. We were on one of the top three boats on the Nile by all accounts. And it was like a grand hotel. Now, while the food was only adequate compared to, say, a five star hotel, the service was exceptional. Everybody was delighted to see you, your every desire was made possible and they truly made you feel at home. Our biggest food complaint was that the meals were simple and boring; they seemed to be catering to the common denominator of the mix of people on board rather than offering local cuisine. Our other big complaint was that they ran out of the French Bordeaux; neither the couple we were dining with nor we could handle any more of the Egyptian wine. We drank the boat's last bottle of Bordeaux at our last dinner and that was that. It quickly became apparent to us that anybody you'd meet who helped you in any way expected baksheesh. Go to a temple and you'd see a man dressed in local attire sitting in a lovely place for a picture; in fact, they will pose with you for the picture. Be prepared to pay. 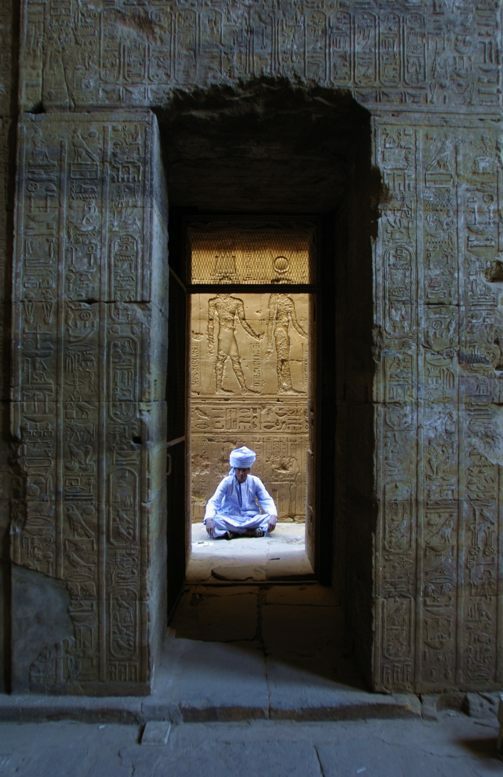 At the temple in Edfu, there was a local man particularly well positioned and perfectly costumed for a picture. As soon as the tourist in front of Mike went to take the picture, the old guy would move out of sight. After a couple of tries, the tourist left. Mike motioned to the old guy that he was prepared to offer him baksheesh and he not only posed for Mike's picture, he volunteered to have Mike take a picture of him with Katherine. On another occasion we were walking around the Luxor museum when a man approached Katherine, who was looking at a statue, and started to explain some things. He then followed her around for five minutes, despite her trying to nicely say she didn't need help. He was very disappointed when she didn't give him baksheesh. Mike has a real problem with the begging. Virtually every kid we saw would hold out his had and ask for baksheesh. 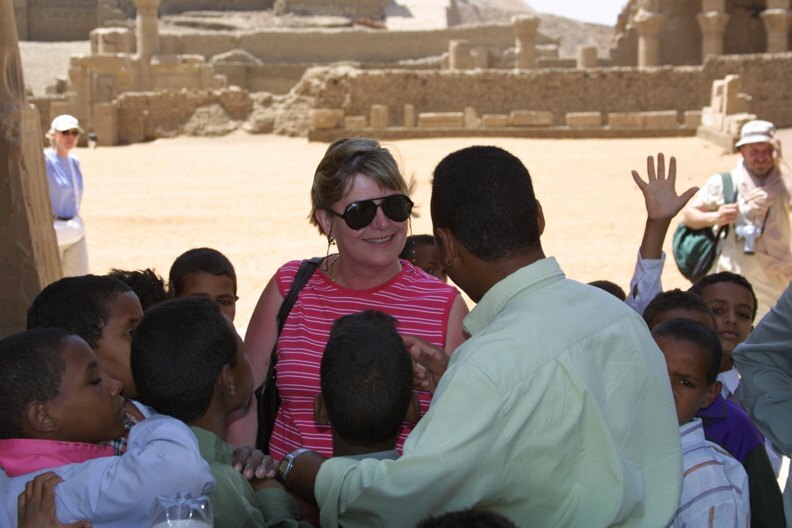 When we were touring Luxor in the horse-drawn taxi, once the kids saw we were tourists they would run after the carriage begging. And, as we have noted, everybody ingratiates themselves with the hope of getting some baksheesh. It seemed to Mike that this builds an idea from childhood that equates foreigners with those with money and that the only way to get it is to beg. And the people can't help but being irritated with us if we don't give them something. We just don't think that this builds character. In none of the Asian countries we have been to was anybody begging; they at least had something to sell. Indeed, in a number of the countries, tourists were strongly discouraged from paying for pictures. Security is obviously of major concern in Egypt. There were armed guards on the boat although we never saw them with clips in their guns. 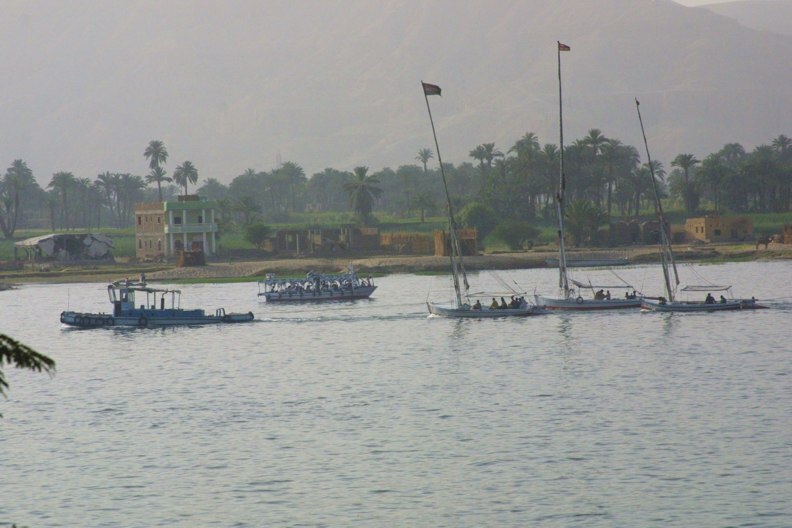 Boat trips below Luxor had been suspended for some time because of the threat of terrorist attacks on the boats. Any trips on the highways out of the major cities have to be by armed caravans; cars, buses and whatever would collect at the appointed time and would depart with an armed entourage. Some of the boats have some kind of theme-night for several of the evenings. Our first night was an introductory cocktail party, the theme for our second night was to wear Egyptian garb and for the third night it was black and white. We do not do cruises so were a little surprised at such things; but they turned out to be fun. There was however, one difference on these cruises. When we went back to our cabin after the Egyptian night, Kath walked into our cabin and was shocked to see someone sitting on the bed. 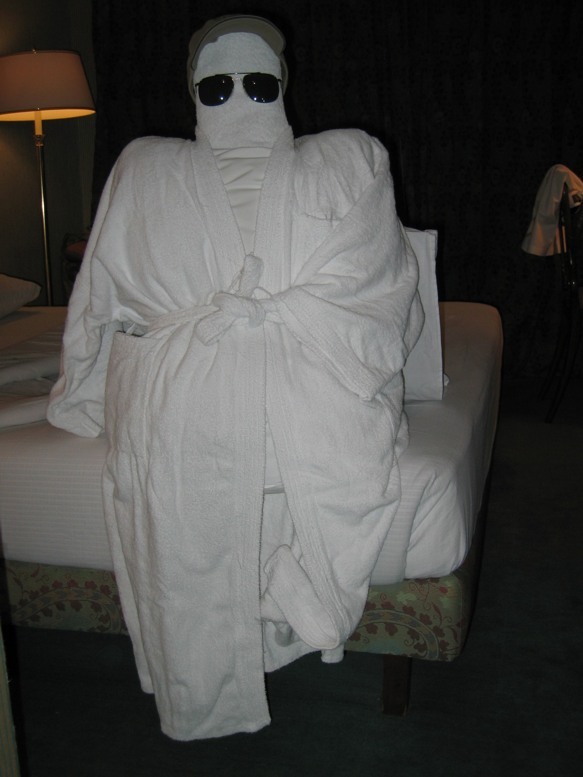 After turning on the lights, we found a very interesting addition to our cabin; it seems it's a tradition on the Nile. Each night we had a new visitor; you'll have to check out the photo album to see what we mean. Our weather was good every day. When it's windy, and thus dusty, you can believe it could be miserable with dust getting into everything, including your camera. 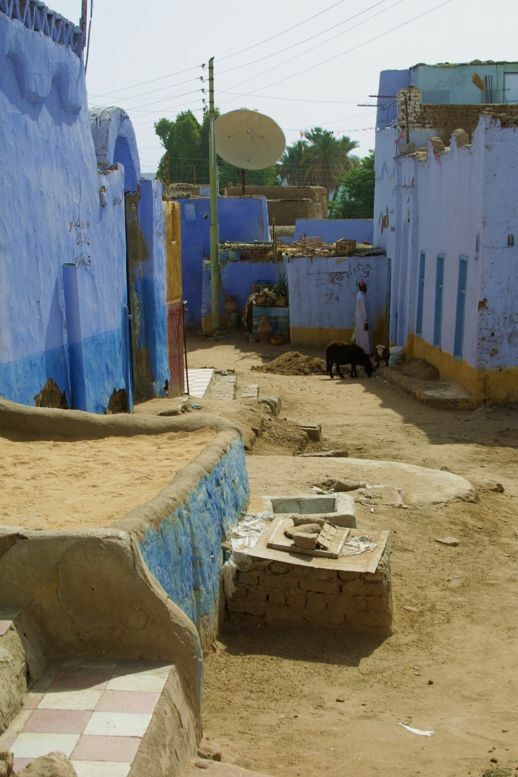 It is also much hotter in upper egypt than in the Cairo area, where temperatures were quite tolerable. Now we were at the end of the high season so ran into hotter temperatures but fewer tourists. As it was, most places were fairly crowded; so we can't imagine touring the temples with a lot more tourists. We saw several people who were overcome by the heat. You need to take a lot of water and drink it. Of course, Mike would have preferred stopping for a beer but that wasn't available. 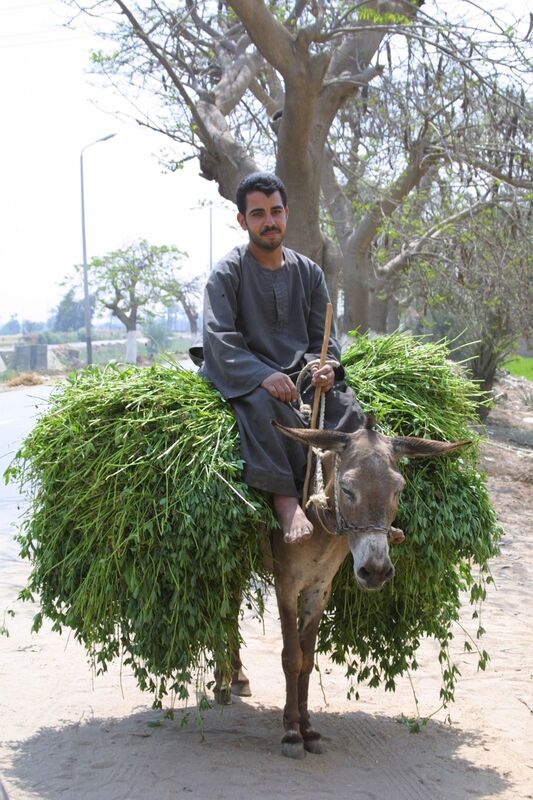 While there were a lot of horses around, donkeys were clearly the beasts of burden hauling everything imaginable. 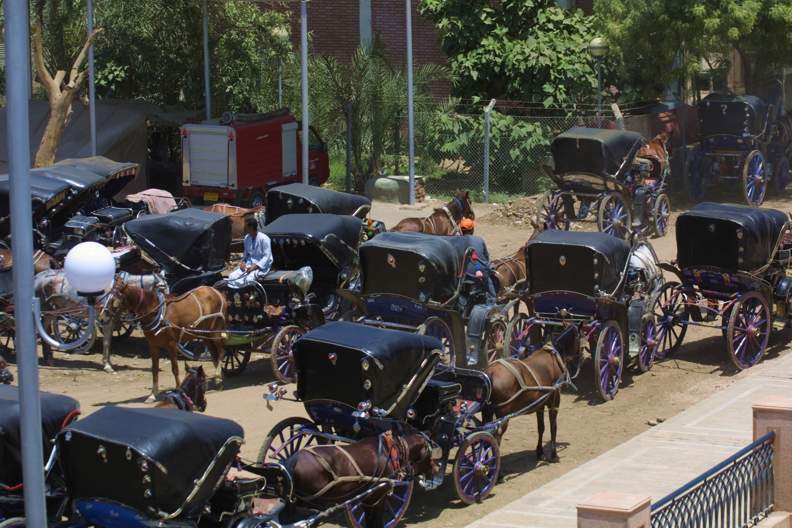 Horses seemed to be used only for the carriages and donkeys for hauling stuff. If you're a horse person, you will probably be dismayed at their treatment. We always are entertained by what nationality the locals think we are. On this trip, most of the vendors would start talking to us in German. And there were a lot of Europeans on the tours but not many Americans. They don't mind the Germans, they like the French, they dislike the Brits and are at real odds with how to react to Americans. 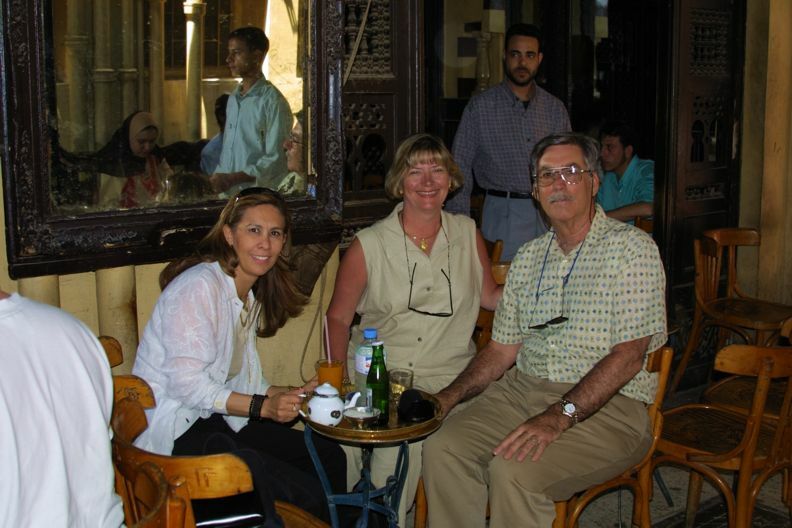 Our Cairo guide told us that they do not like the American administration but hold no grudge against the American people. We were more than a little concerned with how people would react to us being Americans so told people we met that we were Canadians; nobody hates the Canadians. Neither of our guides had much good to say about the Italians. They ignored the guides' lectures and the men continually made passes at our Cairo guide and anybody else walking around in a skirt. This is not travel for anybody who can't do a lot of walking or climbing. Everywhere there were long walks, steps to climb, and crowded passageways to traverse, not to mention the problems of getting into and out of boats, carriages and other forms of transportation. Both of our guides took excellent care of us. Abdul, in particular, was always on call when someone was late picking us up or when our travel schedule had to be altered. He did whatever we wanted and tolerated our constantly stopping for photos. And Shareen spent a great deal of time with us in the Cairo market helping us find what we were looking for; checking out each shop and getting the merchants to see if they had what we wanted. We were a little disappointed that we never really had Egyptian food. None of the hotel restaurants had any. 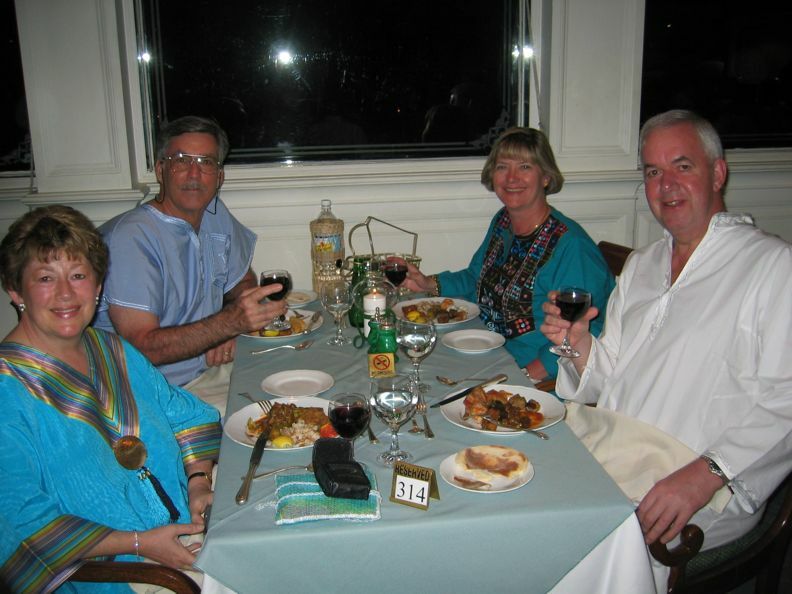 All of our meals on the boat were included and none of them offered much in the way of Egyptian cuisine. And we saw precious few restaurants anywhere during our touring that we'd be tempted to go into. Of course, Mike's basic axiom of travel is that he doesn't want to go to any country where he wouldn't want to eat the food. And when's the last time you had Egyptian food or even saw an Egyptian restaurant? His point exactly. Now the Le Meridian is a five star hotel. And yet the water coming out of the tap had a distinctly brown cast to it; and, yes, we were advised not to drink the water anywhere. On top of that, the toilet never worked quite right even after being "fixed", the towel rack fell off one morning and there was a general sense of disrepair here and there, like nobody was taking care of the place. The food at the various restaurants was adequate at best. We expected a little more; it's not a hotel we'd go back to. On the other hand, the view of the pyramids was great. We had mild intestinal problems throughout the trip, Mike in particular. What added to the problem was that their toilet paper is like sandpaper. Mike would suggest bringing a lot of Pepto Bismol, imodium and Talcum powder; and a roll of Cottonelle if you have the room. One of the things that was very distressing was the Television. The only two news channels we could get were the BBC and CNN. Now all the BBC seemed to be showing was either a snooker tournament or documentaries on Africa. So we were forced to watch CNN International. For those of you who don't leave the US, there are two versions of CNN, domestic and international. It's no wonder the whole world hates us. Every CNN International broadcast was critical of the US. Every interview blamed the US for everything with no one offering any rebuttal. All the news coverage was slanted to make the US, or more accurately, the current administration, look bad. It was really depressing. And the editorials in the local newspapers were seriously anti-American, blaming us for every problem in the Arab world. Was it a great trip? Yes. Would we go back? No. Egypt is a place of remarkable sights but beyond that, we've been there and done that. Our best trips are when we get a chance to get the real feel of the people and country. This trip, despite being planned by us, kept us on the 'tourist trail'. We saw little that the Department of Tourism didn't want us to see. 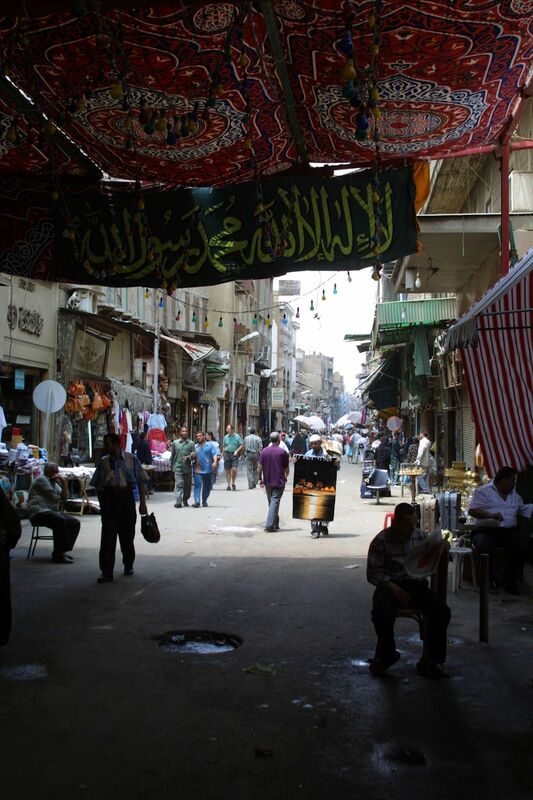 There was little endearing about Cairo and not much we'd want to revisit in upper egypt.